Get your gardening questions answered by OSU Extension Master Gardener volunteers like Judi Sanders. Photo by Lynn Ketchum. How often do you find exceptional, customized advice for free? If you, family members, or friends have a gardening question, there are two ways to get free, reliable advice. No, it’s not an Internet search! Email a question to Ask and Expert, or pick up the phone and call a Master Gardener. Both resources are courtesy of OSU Extension Service. 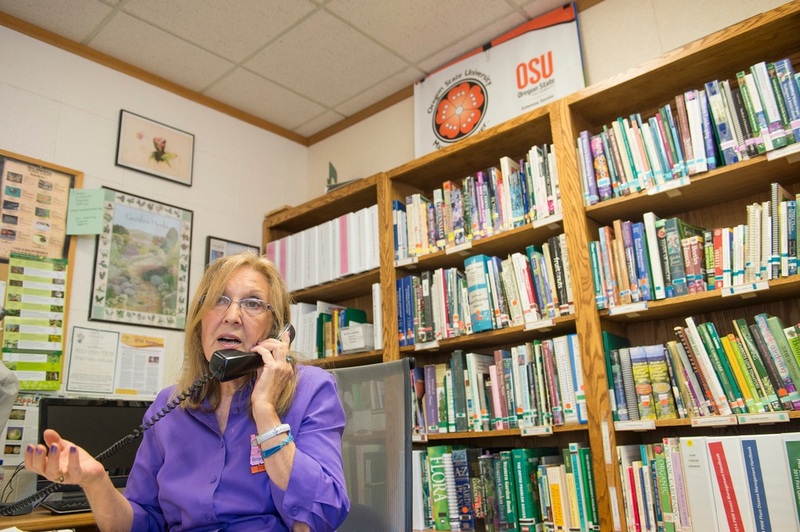 Kym Pokorny, news writer for OSU Extension and part of the Extension and Experiment Station Communications (EESC) news team, recently wrote an article about Master Gardeners. Below are a few highlights of the article; the full article can be found here. Twenty-eight county Extension offices host Master Gardeners. Novice or experienced gardeners with questions are encouraged to bring samples or send photos of the plant or insect into the local Extension office. Then let the Master Gardener go to work to comprehensively research your question. It takes almost 70 hours of intensive training to become a Master Gardener, then every year thereafter additional training for recertification is required. After certification, Master Gardeners are asked to donate 70 hours of their time for community service. (In my experience, quite a few volunteer many times that amount of time!) 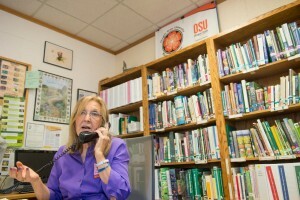 Manning the phones and having office hours in an Extension office are ways to fulfill their volunteer commitment. Master gardeners also work directly with the public at farmer’s markets, plant sales, garden shows, county fairs, demonstration gardens, schools, and correctional facilities. Most counties offer a seasonal slate of classes, too. Gail Langellotto, associate professor in the Department of Horticulture, College of Agricultural Sciences, is the statewide master gardener coordinator, a program that encompasses more than 3,000 active volunteers. Training is essential. “A lot of times people call wanting verification of something they’ve looked up on the Internet,” Langellotto said. “We use that as a jumping off point for a conversation. We make sure a person knows the questions to ask to get the answers they need.” And that’s why scientific advice, customized to situations in Oregon are so important. You may also want to check out OSU Extension’s Gardening Community Page for information on a variety of gardening topics. The site includes gardening tips, videos, podcasts, monthly calendars of outdoor chores, how-to publications, and information about the Master Gardener program. OSU also has several publications, of specific interest to home gardeners, available online on the OSU Extension Publication Catalog. Posted in Community Outreach, Extension, Resources.